From the initial tale of his struggles to find the time, money and materials to build a family tomb, Szymek takes us on a trip through time, recounting stories of his days in the Polish resistance during the Second World War. While it’s difficult to keep the narrator on a path free of digressions, the patient reader is eventually rewarded with more glimpses of what came between the end of the war and his current situation. If Szymek appears to be a lonely old man stuck on a farm in the middle of nowhere, there are reasons for the way he has ended up. However, now it is the land’s duty to make man a profit, and the farmers follow whatever trend will make the most money in the shortest time, even if this has negative long-term consequences. Fields are sown with unsuitable (but lucrative) crops, and liberal sprinklings of nitrates are used to increase yields. Worst of all, the younger folk are abandoning their homes for the city, leaving the land to the mercy of the old and frail. Stone Upon Stone is an excellent read, and a fairly easy one at that. I wolfed it down in four days (not bad for around 560 pages), and that is due in part to the fairly simple language used in the book. In the excellent interview with Scott Esposito (available as a Two Voices podcast), Bill Johnston talks about how the key to translating the book into English was finding the right way to bring Szymek’s voice across into the new language. His solution was to avoid complex Latin-based words, sticking with simpler Germanic-based vocabulary. Whether that’s the reason for the success or not, the voice definitely works. …that is, if he can get the cement. In terms of BTBA v IFFP then, I’d have to say that the score is 2-0 to the American prize. While the 2013 contest was a close one, with Satantango just edging out The Detour in a battle of very, very different styles (Krasznahorkai’s never-ending sentences against Bakker’s stripped-back prose), the 2012 bout was a no-contest. 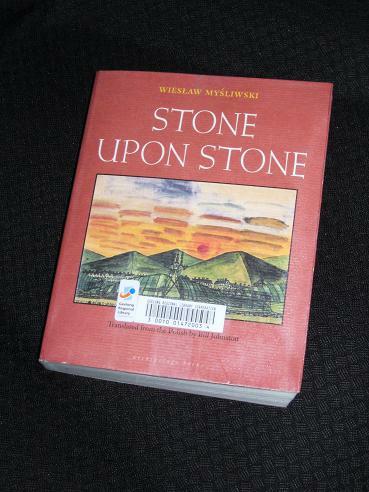 I have made no secret of the fact that Aharon Appelfeld’s Blooms of Darkness was one of my least favourite books on the 2012 IFFP shortlist, and Stone Upon Stone is simply a far better novel. Thanks for the review and the links. I picked up a used copy and was saving this (and others) for Winstonsdad's Polish month…definitely looking forward to it now! Are you going to do a battle of “Sieobo There Below” vs this year's IFFP winner?